It’s Friday. It’s time for my guest author slot and today that hotseat is taken by the multi-talented J.P. Greyheart, who brought along the first book in her first sci-fi / fantasy Saga for Pirantina. It’s a romp, and an illustrated one at that. Sci-fi with illustrations used to be a thing when I grew up, until it went sadly out of fashion. Or maybe I just didn’t look in the right places. Still, better late than never… and welcome J.P. Greyheart! Hey there! First, I’d like to thank Jackie Keswick for having me over to introduce my book. Jackie is my mom’s friend, and my mom is one of those M/M romance writers. I can’t tell you who she is because of nepotism and stuff. However, I can tell you who I am. I am the builder of an alternate dimension and maker of characters who have kept me company for years. Dragons who fly spaceships – and dragons who don’t need spaceships. Alien galaxies that host worlds populated by strange creatures at various levels of social development. Elves with electric swords, merchant draconians, and snazzy, fashionable saurians. Gods, and their children, and their makers. Weapons from magical swords to plasma guns to soul power, all organized into determined units as our heroine’s 21-foot tall mentor leads his troops in the ultimate fight that will determine the fate of his entire galaxy- and possibly the universe. 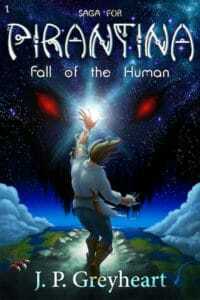 This sci-fi/fantasy adventure is stretching over a series of books. This is the first one. Book 2 is in editing, and I am finishing book 3. Aside from just writing, each chapter has its own illustration plate. Doing these illustrations is a lot of fun, because drawing gives me more ideas for concept art (check out my Instagram), and the concept art gives me ideas for spin-off stories! It just never ends. I have wild plans for this wild world of mine. If the mood strikes, you might find comics, animations, and more! If you get sucked into the Amazon sample read and end up buying my book, please know that I’m eternally grateful, because I’ll be able to restock my art materials! Also… please consider dropping a review. Reviews are like happy stardust that makes other stories grow. Cheers! A young, struggling artist falls through a portal while escaping from a dragon. She survives on the hostile, beautiful planet of Pirantina, a disc world home to elves, dragons, and gods. Her new companions range from a 21-foot tall mouthless blue humanoid Yaitolan, to a recalcitrant young dragon prince named Jacabo. She lands in the middle of a war zone, and if she loses, it could mean the end of the Universe as we know it. This gripping adventure full of magic, swords, and alien technologies will keep you up till morning. For questions or commissions you can contact J.P. Greyheart here.